Good news for Criterion, no news for FilmStruck, and studios producing films directly for streaming services make me wonder. Good news: The online Criterion collection, currently hosted as an add-on service to FilmStruck (starting in November 2016), and before that as part of the add-on service Hulu Plus (starting in 2011), and before that as a featured component of Mubi (starting in 2008), will finally be going independent, sort of. But it comes at a price. As we've discussed before, WarnerMedia will be shutting down the FilmStruck service as of November 29. 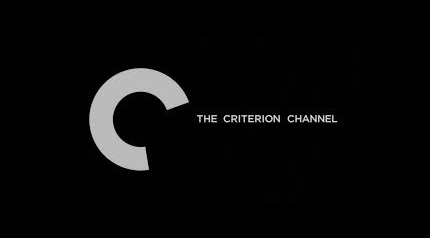 The service was available in the U.S. for $6.99 monthly; to add the Criterion Channel, which included a wealth of digital Criterion titles as well as an increasing number of exclusive features, increased the price to $10.99 monthly. Now the Criterion Channel will be available as a stand-alone service for $10.99 monthly, though it will not launch until Spring 2019. (You can sign up at that link to become a charter subscriber to save on that subscription price.) It will also be available through WarnerMedia's new streaming service, which will launch in the fourth quarter of 2019. That's good news. I signed up immediately to become a charter subscriber. The service will be "wholly owned and controlled by the Criterion Collection," according to their announcement, which is also good news. The price hike is a bit surprising, considering the very good value of the FilmStruck collection on its own, but it's not shocking in view of the premium price that individual discs in the Criterion Collection command ($29.99, normally). The quality of the digital copies currently available depend, naturally, on the strength of one's broadband connection, and do not live up to Blu-rays the Collection offers. My budget is tight, and so I am happy the Criterion Channel service will be available again, even if I have to wait a few months to do so. No news: What about FilmStruck itself? There's been no news about its possible survival in a different form. The service hosted several hundred titles, from studios and distributors such as Film Movement, First Run Features, Global Lens, Flicker Alley, Icarus Films, Kino, MGM, Milestone, Oscilloscope Laboratories and Shout! Factory, as well as Warner Bros.
Quite often, I found that when I started up the FilmStruck app, one of more of those titles caught my eye and that's what I watched. Sure, the Criterion Collection, built up over decades, is stronger and deeper overall, but I loved the collection of films that FilmStruck offered; if caught in a deeper financial pinch than usual, I would gladly subscribe to it as a solo service -- which I did during the first two months of its existence back in 2016. A trade report at Deadline just before the Criterion Channel announcement suggested that the FilmStruck collection might be "part of a package of streaming services from WarnerMedia. ... The company is figuring out a way to make it among several branded-content offerings in its OTT service." My hope, perhaps overly optimistic in view of other news (below), is that classic and independent films, including not only Warner Bros.-owned titles, but also those from other distributors, will be included as a component of WarnerMedia's upcoming service. Things that make me wonder: First came news that A24 Films will produce original films directly for Apple (via Collider), soon followed by news that Paramount Pictures will produce original films directly for Netflix (via ScreenDaily). Both make financial sense, though the deals raise questions (again) about theatrical prospects. In related news, Netflix, long known for its streaming-first distribution policy, decided to give selected films theatrical releases ahead of their debut on the service, supposedly to increase their chances to secure award nominations. The first three -- Roma, The Ballad of Buster Scruggs and Bird Box -- have now been joined by Mowgli: Legend of the Jungle. As for Amazon Studios, it currently releases its film titles in theaters ahead of their debuts on its streaming service Amazon Prime. It's not clear if A24 Films will be giving their 'made for Apple' films theatrical release. The Paramount announcement claims that the studio has the capability of producing 'more content than the theatrical system could accommodate.' Paramount previously sold off The Cloverfield Paradox to Netflix, reportedly for some $50 million. Every studio and production company needs to turn a profit, of course, but all these streaming deals make me wonder again about the future of the theatrical experience. More than ever, it seems that action/sci-fi blockbusters will continue to dominate in that space, leaving lower-budgeted, independent films to continue to seek out audiences at art houses and court streaming customers on an increasing, sometimes bewildering number of services. Same as it always was? Notes on Streaming is a column on the business and pleasure of watching movies and series on legal streaming services. Your comments are always appreciated.